Start by heating the olive oil in a large pot over medium-high heat. Sauté the garlic for around one minute or until golden in color. Then incorporate the onion, bell pepper and tomatillos. Continue to sauté for five minutes before lowering the heat to medium. Cook for five more minutes. Meanwhile, cut the chorizo into 1/4 in. slices and add to the pot. Let cook for a final 10 minutes or until the chorizo begins to brown. When ready, remove from heat. Transfer to a large dish and serve hot. If you can't find Spanish chorizo sausage try using Portuguese linguiça, which is a good substitute. Any color of bell pepper can be used in this recipe-red, yellow or orange. If you don’t have any fresh peppers on hand, canned peppers will also work fine. A few years ago, I visited Madrid, Spain where I had a wonderful week amongst my friends. One of the things that I liked most were the nights we went out de marcha or “to march.” This meant to go out and sample appetizers, have dinner and go dancing in one of the bars. When I say go out for an appetizer, it’s really what they call tapear or “go for tapas”- a culinary tradition of Spain. One evening we went to a tapas bar where a deliciosa sangria was served alongside an assorted tapas of olives, meat and chorizo. These beautiful memories of Spain were my inspiration for creating this garlic and chorizo dish. 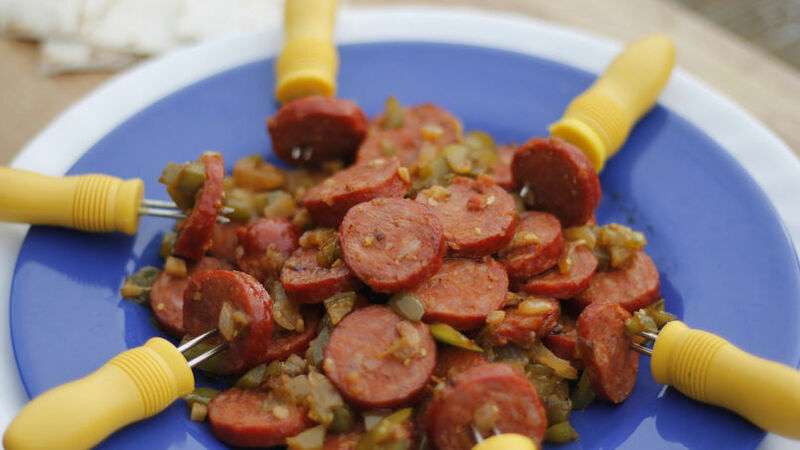 Its sabroso and easy to make- just make sure to find a quality Spanish chorizo to start.